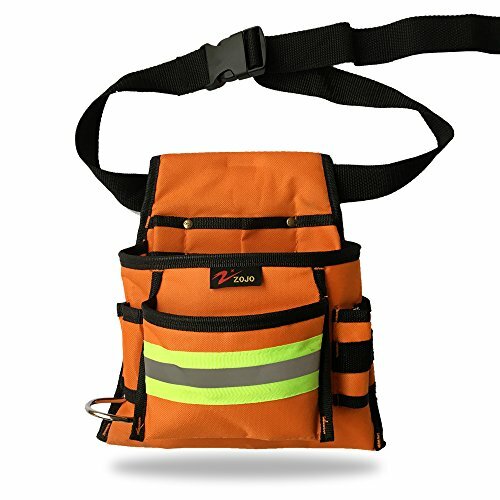 ZOJO Durable Tool Bag/ tool pouch/tool belt/tool holders Fit for Any Job. Ideal for all kind of Jobs like Roofers, Handyman , Repairing ,intenance Workers, Construction Workers, Plumbers, Electricians, Carpenters, Mechanics, HVAC technicians, craftsman, gardeners and machinists Etc. 1 metal Loop is Ideal for hanging larger tools such as hammers. From the heavy duty Oxford fabric and the reinforced stitching, our tool pouches can be frequently used for a long time. You can focus working on your projects, and less time worried about the reliability of your tool belts and the safety of your tools sets. 1 Piece A +++ Level reflective strip : this tool pouch have a 0.6 INCH reflective stripes makes you bright at night, can be easily seen 1000 feets away in the traffic. With the help of our adjustable belt and quick release buckle, our tool belts are ideal for the waist from 26 to 44 inches. Customer's Satisfaction is ZOJO'S priority, we hope each customer pleased with our products and customer service, so you can send back our tool bags for a replacement or money back if you not pleased with them. Just "Add to Cart" to order your ZOJO Tool Bags today! ✔SATISFACTION GUARANTEED - Quality and Customer First , Free return and 100% refund or have a replacement if you not satisfied with our ZOJO tool pouch. Just "add to cart"
If you have any questions about this product by zojo, contact us by completing and submitting the form below. If you are looking for a specif part number, please include it with your message.